Hi, I’m John. Welcome to the website of the Bagpipe Guy! With over 30 years’ experience as a piper, I ply my craft everywhere from my home town of Launceston, Tasmania, to Edinburgh Castle and beyond! I can deliver the performance you need for your special occasion. 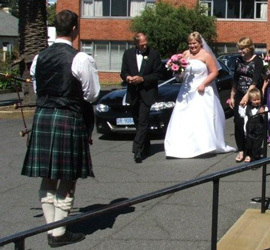 The Great Highland Bagpipe can be a wonderful and cost-effective way to add a Celtic flavor to your wedding. To mourn the passing of a loved one with a sense of occasion. 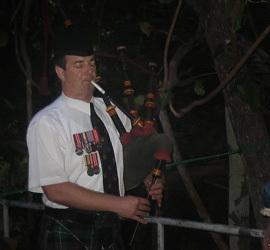 There is something in the sound of the bagpipes that evokes our deepest emotions when we hear it. Birthdays, Burns’ Nights, or ‘Any Excuse for a Party’. They all run better with bagpipes. 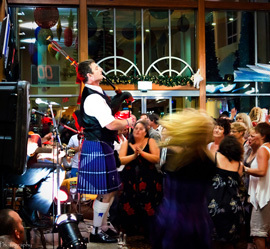 Hire a bagpiper for a birthday surprise, your next big party big or small.